I first heard about the Highland Trail 550 in Utah, of all places. Last summer I was cycling along a lonely dead-end road in the American desert when a car pulled over. The driver hopped out and asked me if I fancied a cold bottle of water. When it is 40C and there is no shade in sight, that is an offer you do not refuse. The driver was a keen bikepacker and we started chatting about our dream routes to cycle around the world. 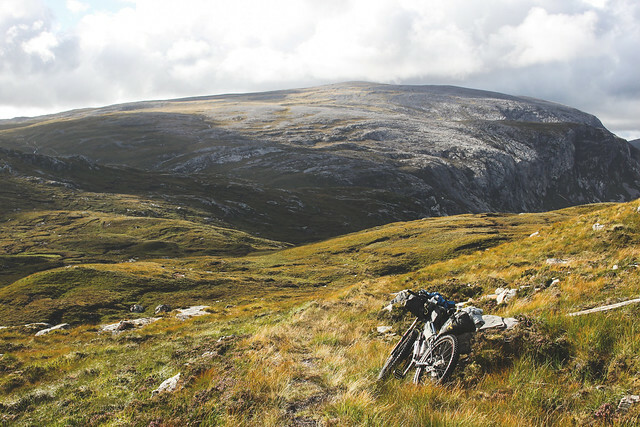 It was when he described the Highland Trail 550 that Scotland entered my radar as a destination for the ‘to-cycle list’. The landscapes I rode through in Utah and the American West were wild, unfamiliar and exotic to me. 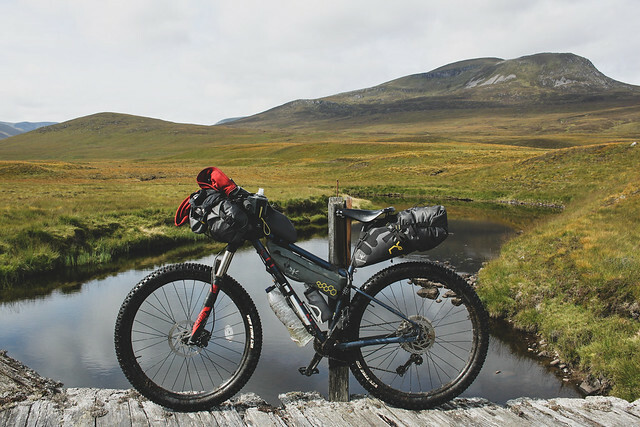 I’d travelled so far in search of adventurous roads and so to hear someone tell me that they had a bucket-list bikepacking route in Britain was surprising. A few days later I Googled the route. 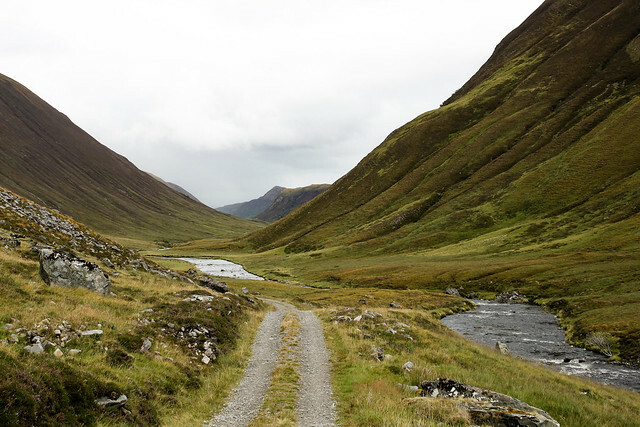 It could not have looked more different to Utah; the Highlands were lush and green, the mountains shrouded in dark clouds and there seemed to be endless miles of remote tracks weaving around the hills. 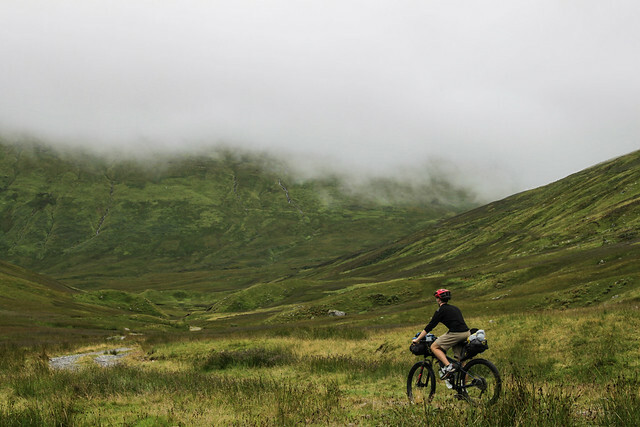 I had already planned to end my around-the-world cycle by riding home to London from John O’ Groats simply because it would be a nice way to conclude the trip, but suddenly I was just as excited about exploring the Highlands as I was about any other place on my map. 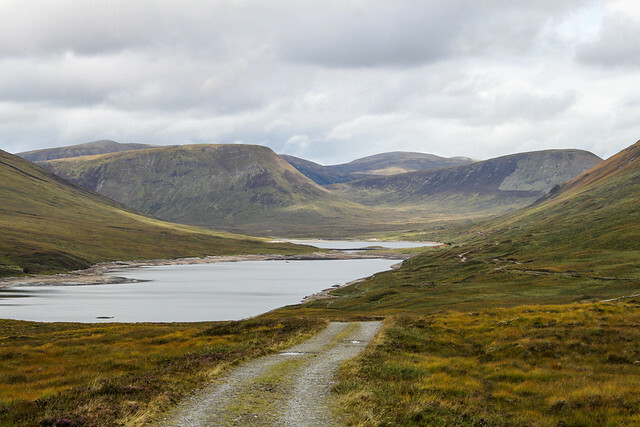 When I did cycle down through Scotland last November it was my first trip to the very North of Britain. It was stunning but I was forced to stick to the tarmac for much of it due to snow and ice. 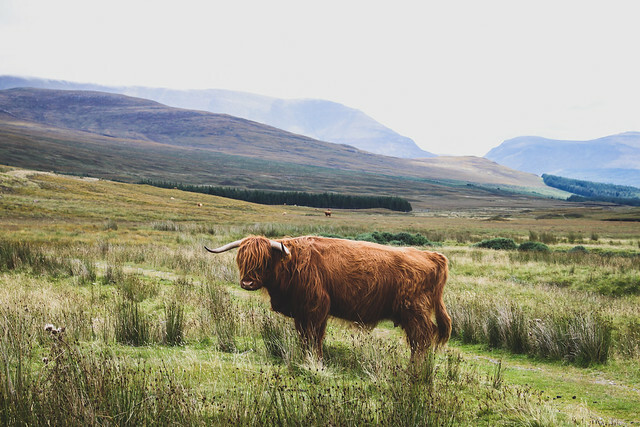 The days were too short and the weather was foul, but that didn’t spot the Highlands capturing my imagination. I decided there and then that one day I would return and ride the route I had heard about in America that summer. 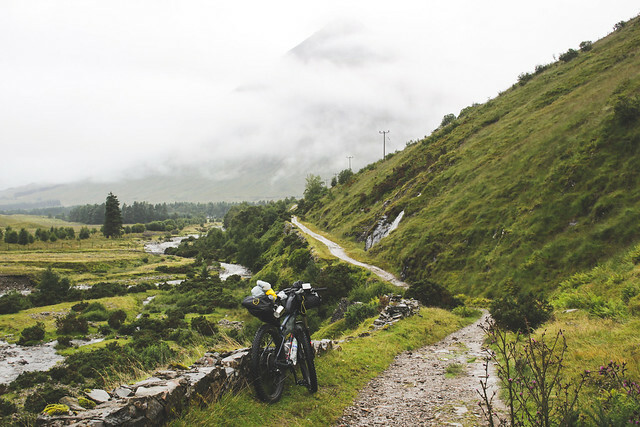 The HT 550 was put together as a self-supported mountain bike race, inspired by the long distance American events such as the Tour Divide and the Colorado Trail Race. The first race took place in 2013 and it has been held annually ever since. I’ve never been in a race before and I certainly don’t plan on making my first one somewhere so challenging. Nor am I interest in doing the route as a self-timed time trial. 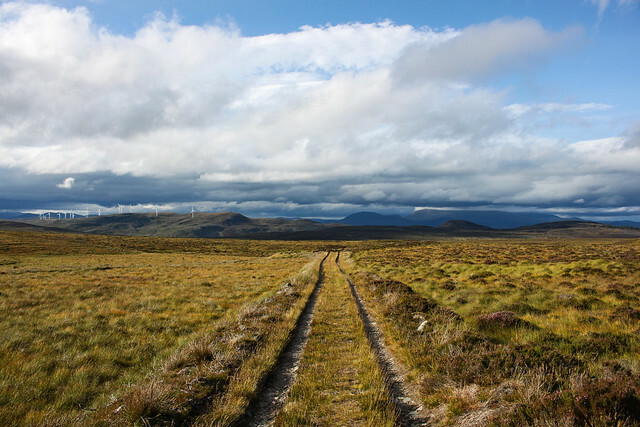 For me, the appeal was just to go riding somewhere beautiful, remote and yet still relatively easy to get to from home. I’ve been cycling a lot recently but most of it involves bombing it around London on my way to and from work. 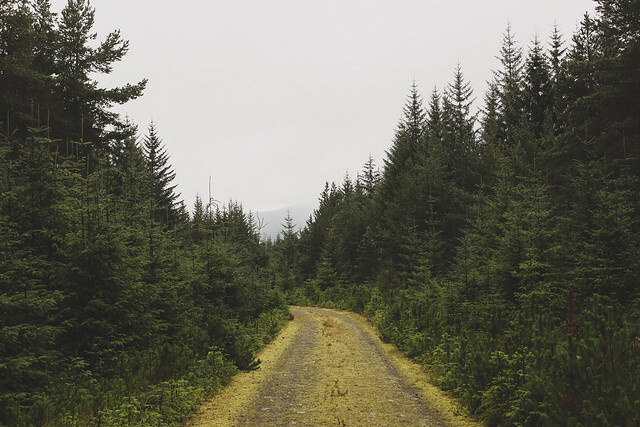 If I can get out of the city for a ride I want to head somewhere rugged and tough. Away from traffic lights and far from any cars. The Dawes that I cycled around the world on is very much out-of-action these days. She’s hiding away in a rusty state in my bedroom but the poor thing was run to the ground carrying me over 30,000 miles these last few years. The shifters are broken, the wheels are wonky, the groupset needs replacing as does the bottom bracket and headset. It will cost a lot of money to do back up to scratch. I’ll get there one day but for now I decided to treat myself to a new bike. 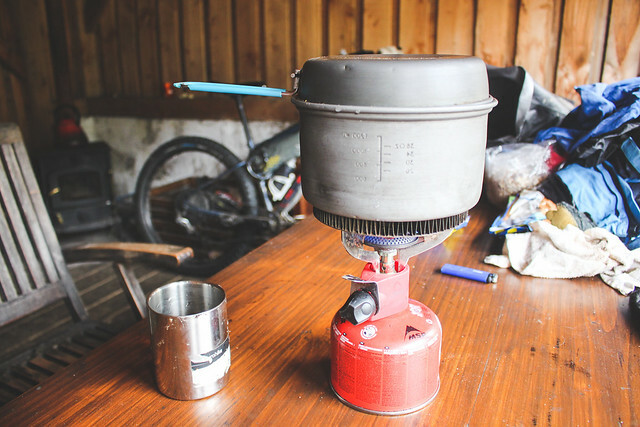 Something that can handle the more adventurous trails that lead you further from civilisation. 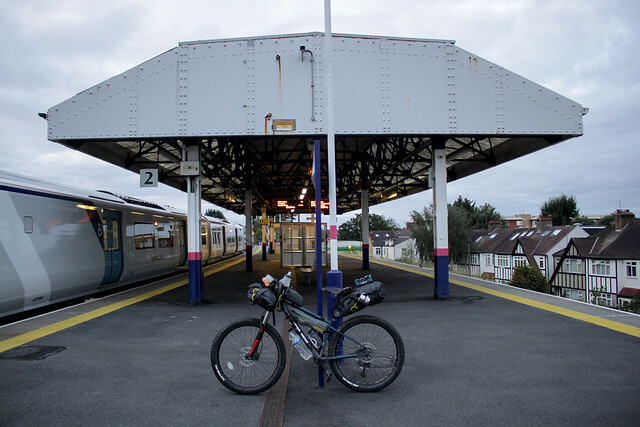 I made a bit of money writing about my long bike ride after coming home. Not a fortune, but enough to buy a new bicycle. 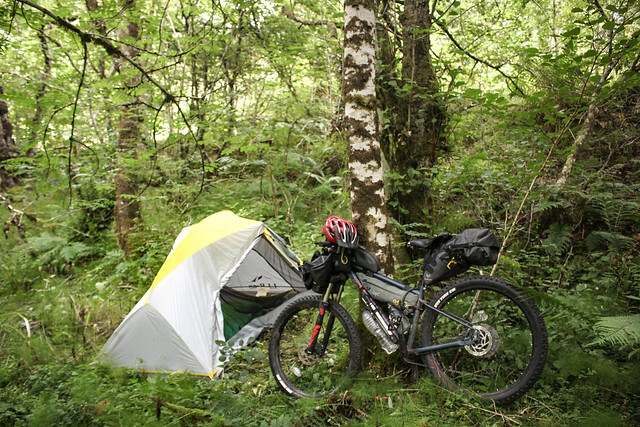 This is the one I went for – a Marin Pine Mountain 1. It’s the first mountain bike I have ever owned. It’s a steel hardtail with monstrous tyres and is an absolute tank. I’ve taken it out on trails like the the South Downs Way towards the South coast of England and it rides like a dream. For a while I was considering doing up my Dawes Galaxy and taking that up to ride the HT 550. That would have been a disaster. Although there are long sections of smooth gravel roads there are plenty of rocky tracks and oh, so much hike-a-bike. I was grateful for the suspension and wide tyres. 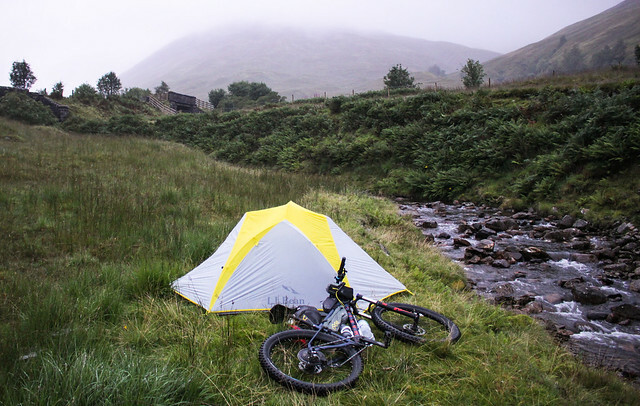 I arrived in Tyndrum at around 8.30pm and cycled straight out of the tiny station in search of a campsite before dark. I actually passed through the same village last winter and arrived in more or less the same situation – struggling to find a suitable pitch before dark. 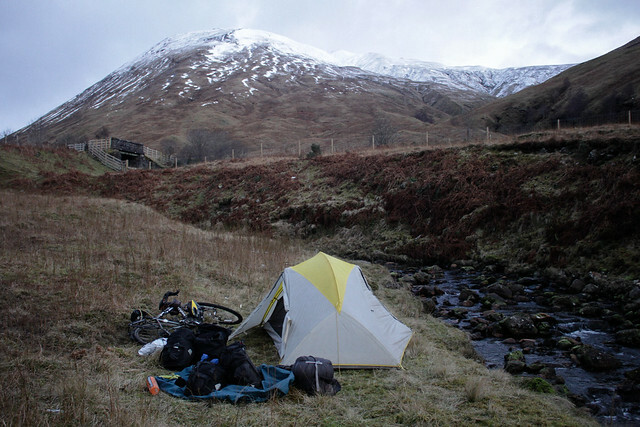 The only difference was that then the days were about half as long and I was probably hunting for a campsite around 4pm! From the station I hopped straight onto the HT 550 route leaving the village. 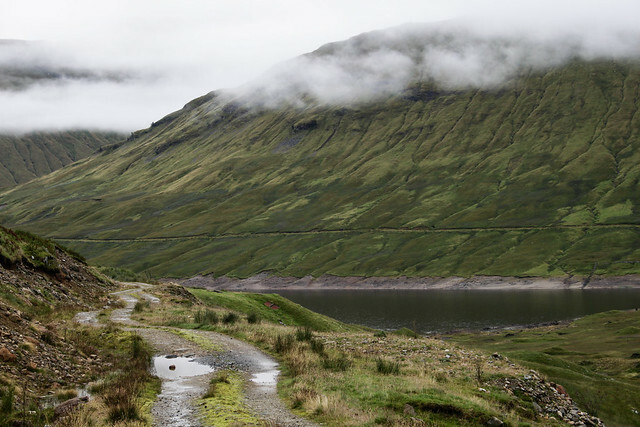 I couldn’t help but think it all looked rather familiar and then suddenly I realised that it was precisely the same dirt road I had cycled last winter. 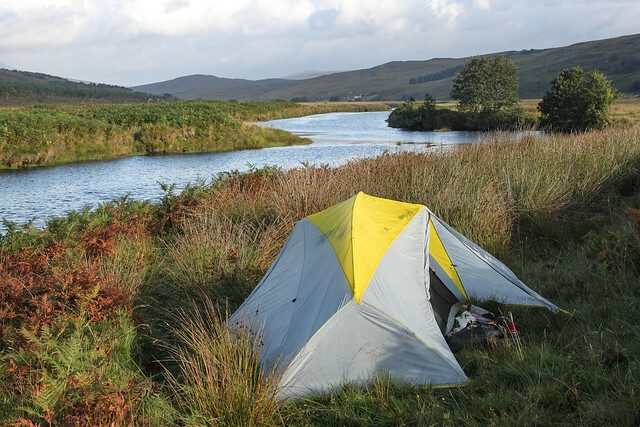 I realised this just as I arrived at the very spot I had set up camp 9 months prior, in a small field by the river. I couldn’t resist the chance to set up camp exactly where I did last time. It takes about 5 minutes from the station before you are alone in the nature. It rained most of the first day but I was happy to be away from the hustle bustle of London city and a little drizzle couldn’t dampen my mood. (Yet!). I wasn’t particularly impressed when, after barely an hour of riding, I had to make my first river crossing. I was able to cycle through, but only just. Then another crossing, and then another. 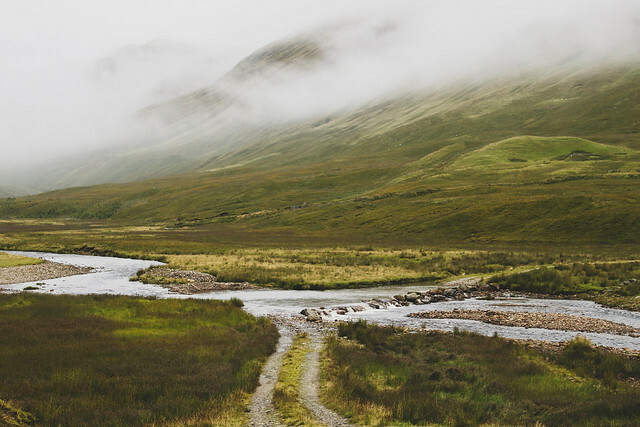 Finally I reached a river that was impossible to cycle through and I had no choice but to wade across. I wouldn’t have minded if it was a warm sunny day but I was cold and wet enough without having to cross chilly rivers. Down South we have had a strange summer in England – it’s hardly rained a drop and we’ve been spoilt with glorious sunshine every day for months. When I cycle out of London the fields have been dry and yellow. 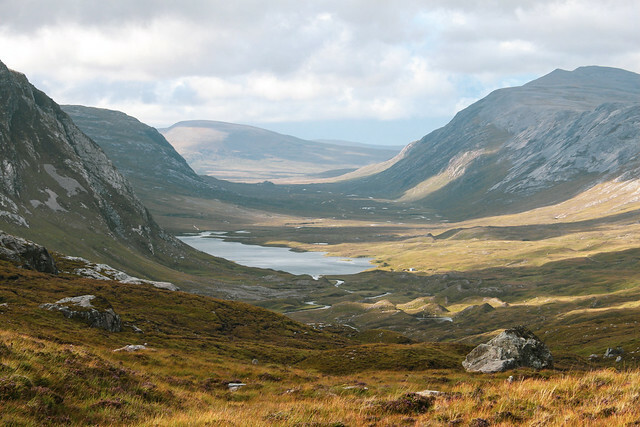 Scotland, on the other hand, was lush and green. Every river was flowing strong. I’d almost forgotten what it felt like to wear more than a t-shirt but Scotland had quickly reminded me what British weather is normally like. These days I have to think about holiday time from work. How things have changed! I wanted to nail the route in 10 days, which I figured would be both manageable and enjoyable. But actually I had no idea how much ground I could cover a day on a mountain bike on such terrain. Surely 55 miles a day would be quite doable? 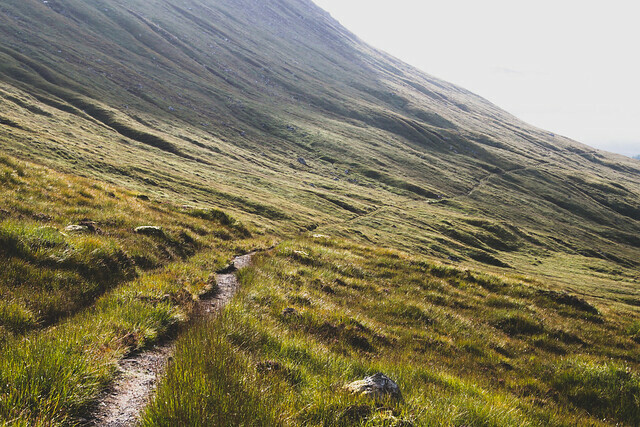 By the late afternoon of the first day I had only done 40 miles and I encountered the first hike-a-bike section skirting Loch Ericht. The trail was washed out and cut straight through a muddy bog. It was hard in places to even find the footpath but the puddles weren’t so deep that I couldn’t just pedal across the grass. But then I dropped down one bank and hit a rivet that was much deeper. It hadn’t been possible to tell as all the water was a dark brown, but my front wheel jammed and I flipped straight over the handlebars. Not hurt, but very muddy. 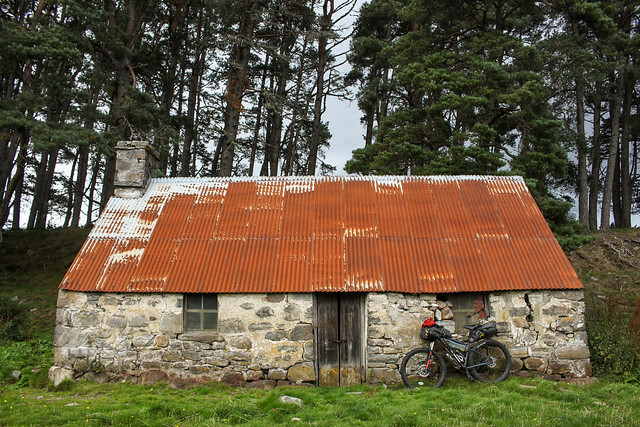 This happened just as I had spotted the first mountain bothy, so I pushed my bike down to the small hut and decided to make that my stop for the night. 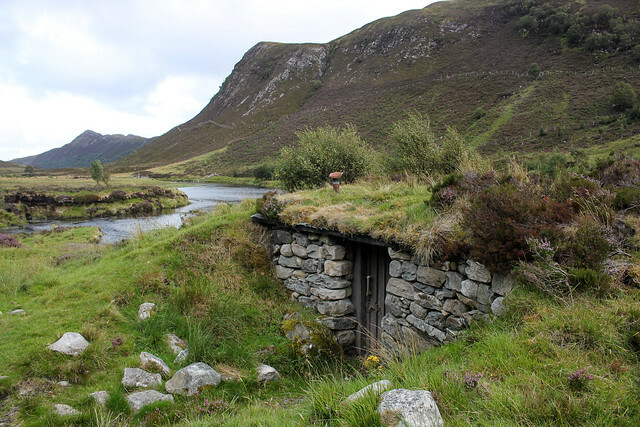 There are bothies scattered all over the Highlands. 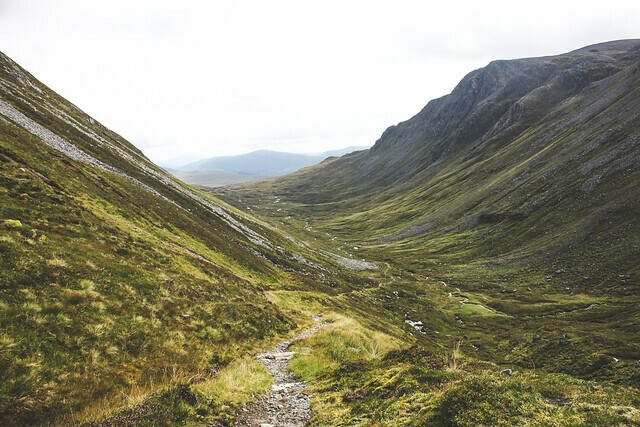 They are basic mountain shelters that are free to use for those wandering the wilderness. Many of them were former huts on the larger estates, others have been converted after time rendered them useless. 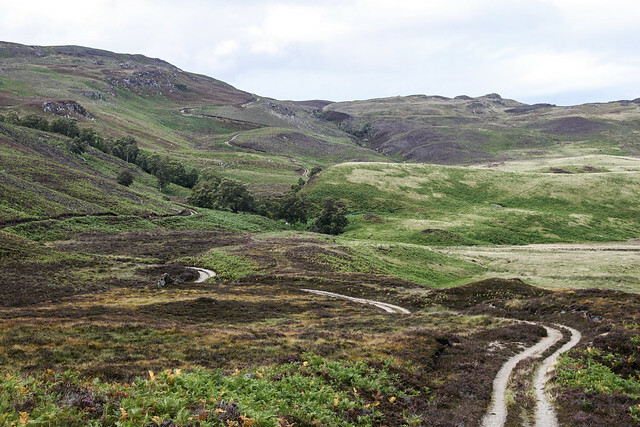 When I last cycled Scotland I didn’t pass any, but on this ride I passed many of them. I actually only stayed in one on the first night but I wish I had spent a few more nights in others. 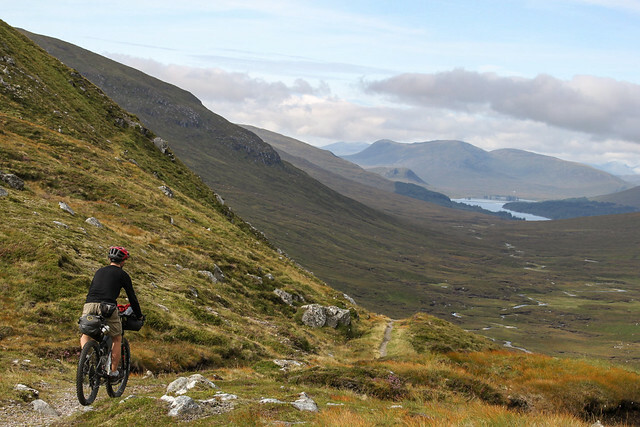 The next day began with a gorgeous section of singletrack around Ben Alder. The clouds slowly lifted through the morning and I didn’t see a soul for hours. I had no idea I would find such remote tracks and have them all to myself. 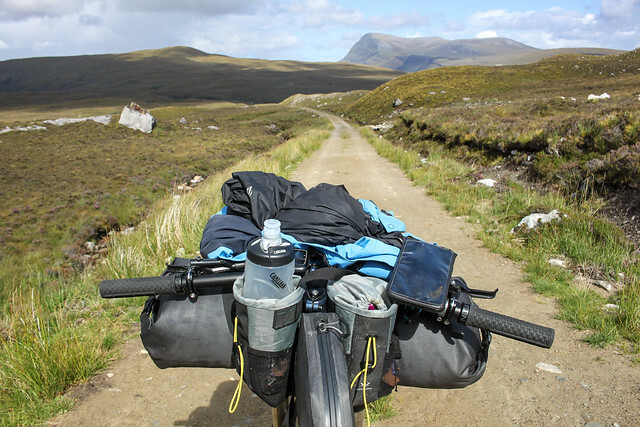 I made better progress and was on schedule to reach Fort Augustus in the late afternoon but let rip on a huge descent and punctured my back tyre. When I took it out, I noticed that there were two pretty obvious holes in it so I decided to quickly patch them up. I stupidly only packed 2 puncture patches so now I suddenly had none. I started pumping up the tyre up and then realised that there were actually two more holes in it. Brilliant. I put my spare in and prayed that I wouldn’t get any more flats on the way to Fort Augustus. I’ve changed tubes in some miserable places in the past but this was up there with the worst. The sun was out, it was pleasantly warm and the wind had dropped. What could have been bad about that? 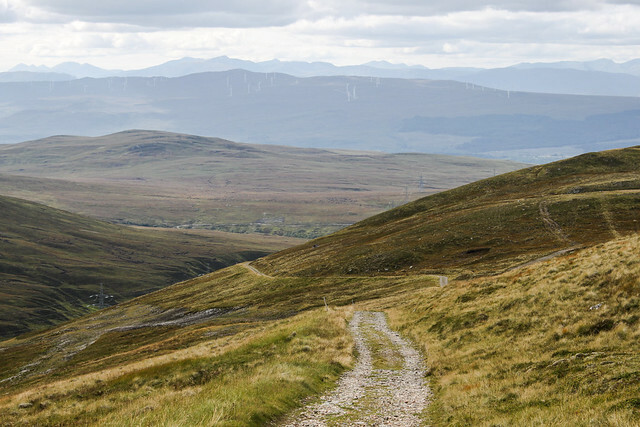 I’ll tell you what – the Scottish midges. I’d heard plenty about about the Highland midges being horrendous. 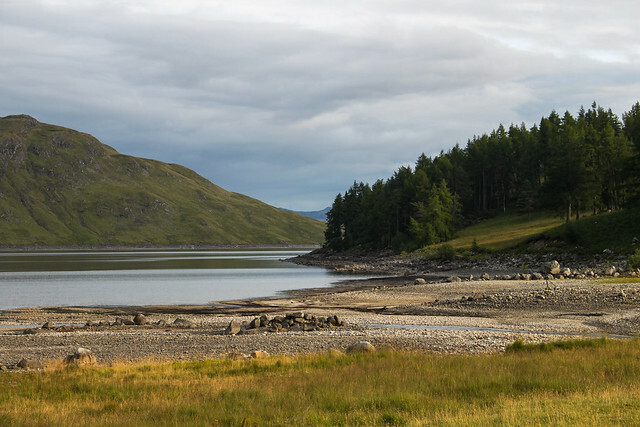 Just as people go mad from the bush flies in Australia, the mosquitoes in the tropics or the sandflies in New Zealand – so to have people had holidays ruined by midges in Scotland. On the whole, they weren’t as bad as I had expected but at times they really tested my patience. 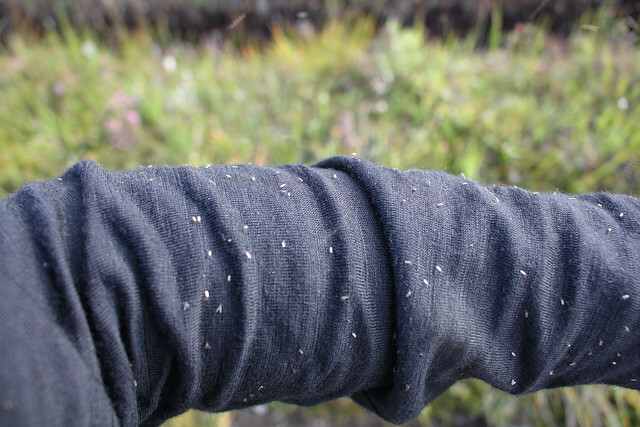 As soon as there is a slight breeze the midges disappear, but when it drops they come out in their millions. You don’t notice them bite you at first and so they quickly get a dozen bites in and then when you go to bed in the evening you itch all over. They buzz around your head and do their best to get a bite in when you are still and distracted, doing something like changing a bike tube. They were at their worst at dawn or dusk when there was no wind, usually just when I was setting up or packing down my tent. They don’t mind a little drizzle either, so those wet mornings trying to quickly pack up whilst dodging the biting buggers were not fun at all – and there were a lot of them. I arrived in Fort Augustus just after the hardware store had closed. Now that I had had a taste of the remoteness of the HT 550 I did not fancy heading anywhere without extra puncture patches. In the wrong section, a mechanical failure could mean half a days walking to get to a road and getting stuck over something as simple as a flat would be pretty embarrassing. 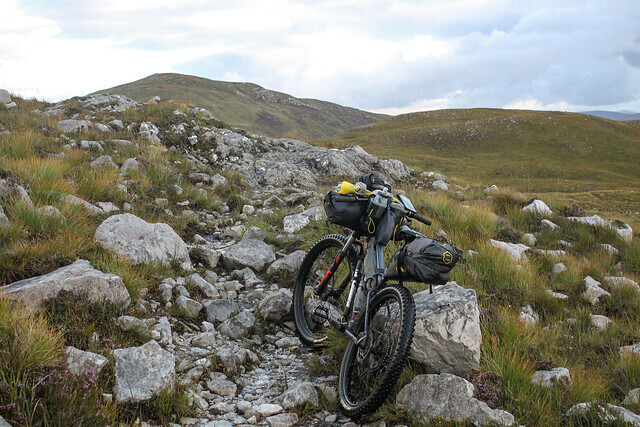 After another frustrating section hiking around the rocky edge of Loch ma Stac, the HT 550 followed a stunning section of double track through a big estate on the way to Contin. The sun was out all afternoon and the everything glowed golden in the afternoon sun. 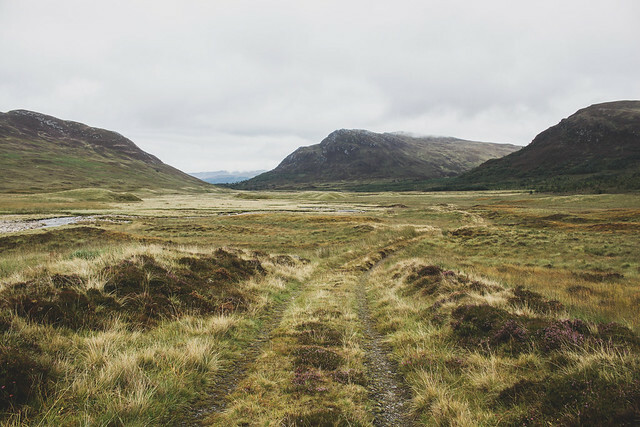 I felt like I could have been out on the steppe in Mongolia – this was not the Scotland I had imagined. It was taking me far longer to get anywhere than expected and so I settled into a slightly more strenuous routine than I had anticipated. I usually cycled/walked for about 7 hours which kept me busy for most of the day. 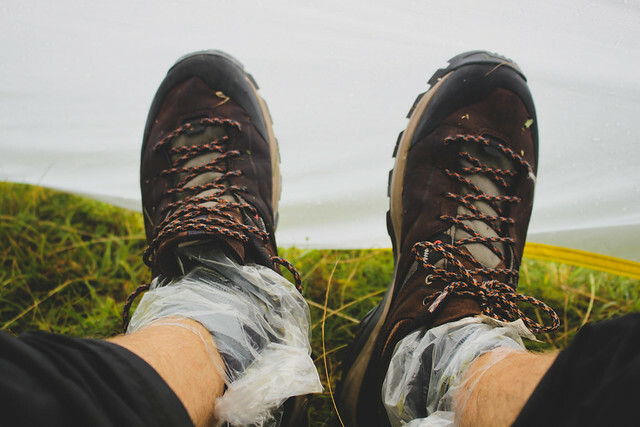 If I had somewhere dry to hide from the rain I’d kill a couple of hours either reading in my tent in the morning or pausing in a cafe to charge my phone. 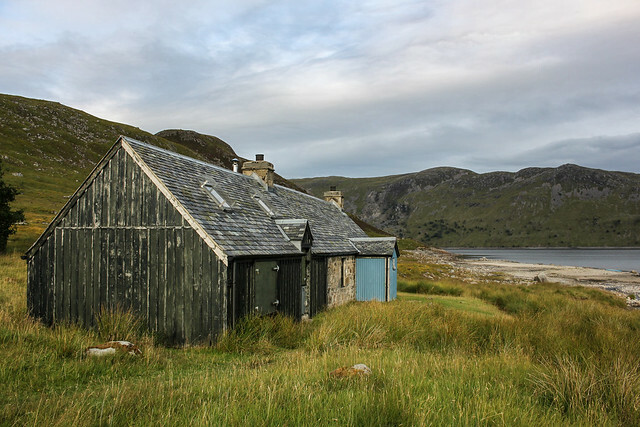 Another bothy appeared just when I was getting hungry and was in search of somewhere to get out of the rain for lunch. 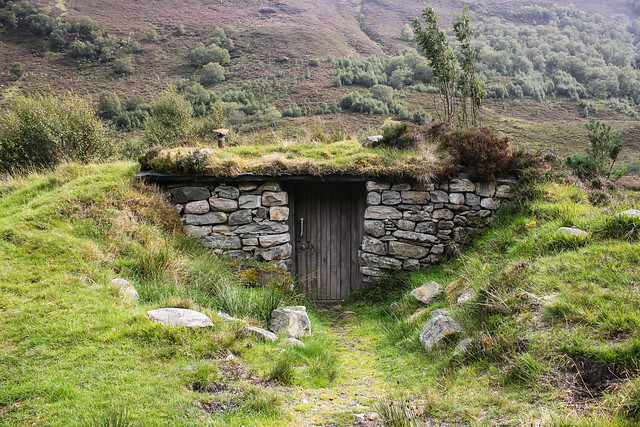 It was easily the cutest of all the bothies I passed and looked like something out the Shire in Lord of The Rings. I cooked some lunch and watched the rain fall horizontal through the hut window. What a beautiful place! I wish I could have spent the night there, someone had even left coals so I could have kept a fire and read my book for the rest of the afternoon. Instead, I had to crack on heading North. I stocked up on a couple days worth of food and headed up towards the Northern Loop. It was really hard to tell how long it would take to cover the various sections. 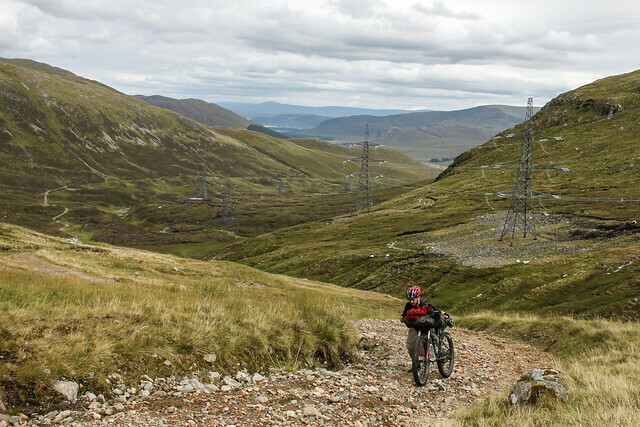 There were long sections of easy riding but plenty of areas where you have to walk for hours and as a result, I figured it was ‘better safe than sorry’ when carrying food. 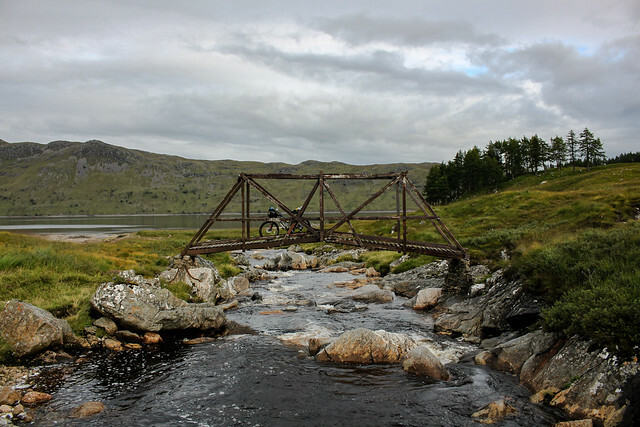 The northernmost section was one of the most beautiful of the HT 550 but also quite a struggle. There are long sections of hiking where the trail was washed out and so my feet where never dry. I would love to ride the 550, sounds like a great route. 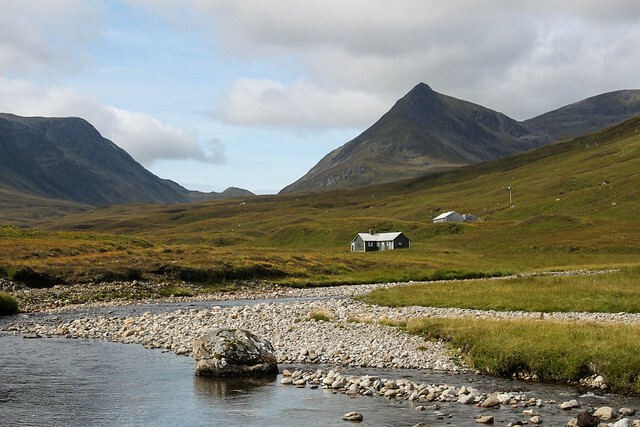 Although the Scottish weather and midges might be a bit of a challenge! 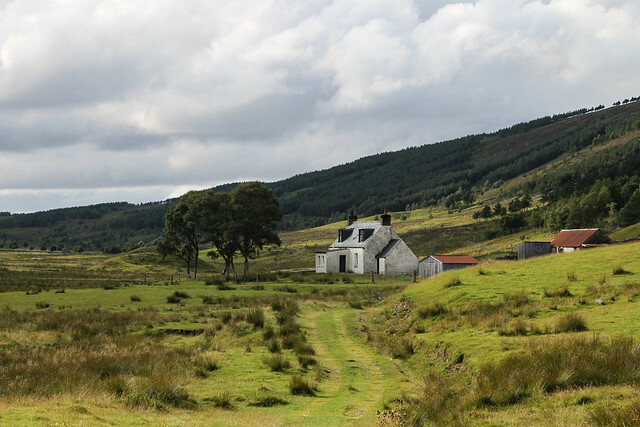 The bothies are superb, particularly the ‘shire’ one. What fabulous pictures! 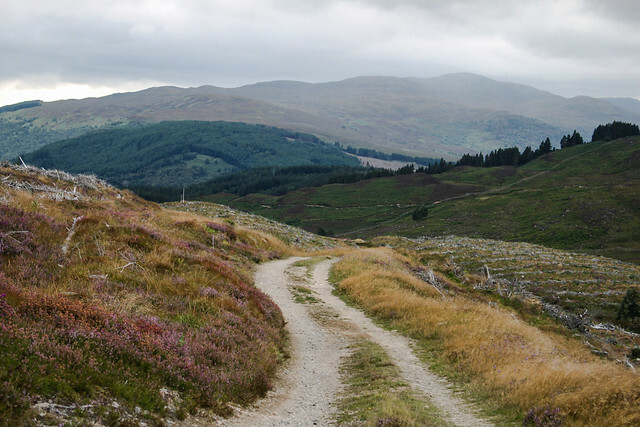 Interestingly, Richard, Christophe and I stayed on holiday in Tyndrum and walked the first part of your trail! The weather was just as bad as it was with you.